One way to get around the traffic mess of Carmageddon: FLY. No, not with your two arms flapping, some pixie dust, and happy thoughts. Try on an airplane. 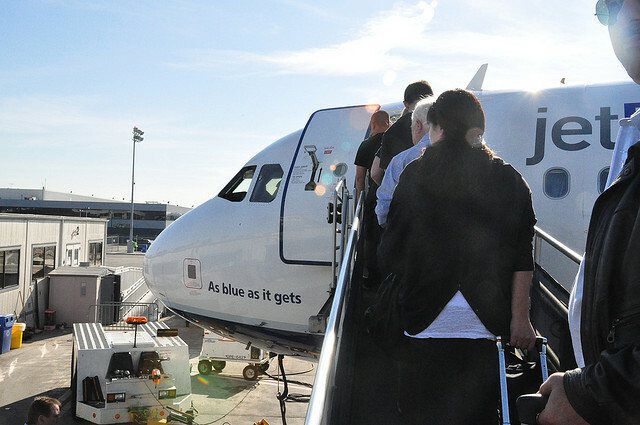 JetBlue has announced they&apos;re offering two special nonstop flights #OverThe405, between Long Beach Airport and Bob Hope Airport in Burbank this Saturday during Carmageddon. The flights will be—and this is kind of insane—$4 each way. Is this a sign of the ultimate "pussification" or sheer genius? Flights leave Burbank at 12:20 p.m. (arrive in Long Beach at 1:05) and 6:35 p.m. (arrive in Long Beach at 7:10 p.m.) and leave Long Beach at 1:50 p.m. (arrive in Burbank at 2:34 p.m.) and at 7:55 p.m. (arrive in Burbank at 8:30 p.m.). If you want to do a roundtrip, you&apos;ll need to leave on the first flight from either end, and take the later one home (no joyrides, we tried booking a there-and-back to no avail). On a more serious note, while carpooling is a recognized way to tread a little more lightly on Mother Earth, and the suggested "beat Carmageddon" alternatives are to stay in your &apos;hood or try public transit (a lot of it will be free), "planepooling" from one regional airport to another seems like it would do a serious number on your carbon footprint.